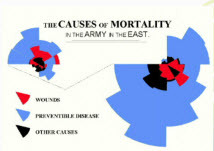 According to BBC reporter Marcus du Sautoy, Florence Nightingale was the first to use pie charts to present statistical data in visual form in her work Mortality of the British Army (1857). Hugh Small, author of Florence Nightingale: Avenging Angel, though disputing the absolute first-use attribution, asserted in his presentation at the Florence Nightingale Museum that “she may have been the first to use [charts] for persuading people of the need for change.” A high quality reproduction of her chart can be found on page 204 of Barbara Montgomery Dossey’s Florence Nightingale: Mystic, Visionary, Healer, available at Falvey (RT 37 .N5 D67 2000). Small’s book available also (RT37.N5 S56 1999).